He ushered in an era of softer names for boys, and some super cool short forms, too. 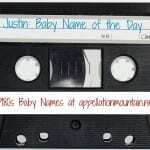 80s week kicks off with Joshua as our Baby Name of the Day. If you were born in the 1950s, there’s a good chance you answered to Bob or Bill. But 1960s boys turned out to be a more diverse lot – less Don Draper, more Kevin Arnold. As parents they proceeded accordingly, and even the conventionally named among began to embrace a new kind of boy’s name. Before there was Jayden, we had Joshua. He’s such a big name in the Bible that there’s much conversation about his name’s origin and meaning. 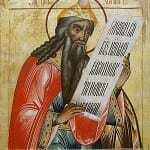 Most agree that the Hebrew is Yehoshua – God is salvation. The Old Testament figure picked up where Moses left off, leading the Israelites into Canaan. There’s more to his story, and it all adds up to a figure significant in Judaism, Christianity, and Islam. Then there’s this: Jesus is derived from a contracted form of Joshua – Yeshua. He’s among the names that found favor in English during the Protestant Reformation, though Jewish families had used Joshua for generations. There aren’t oodles of them in early America. A historic seventeenth century home in Connecticut belonged to Joshua Hempsted. General Joshua Chamberlain served with distinction in the Union Army during the Civil War, and later became Governor of Maine. Joshua Slocum was the first man to sail around the world, and he published an account of his journey in 1900. The name appears in the US Top 1000 every year since 1880. But Joshua really started to climb in the 1950s and 60s, when our attitudes towards boys’ names were beginning a shift of tectonic proportions. Joshua caught fire in the 1970s, the most popular ends with -a boys’ name for years. 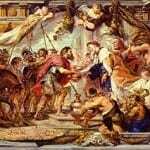 Others followed – the boys called Noah, Isaiah, and Elijah are all heirs to Joshua. Or maybe those boys are his brothers. Joshua entered the US Top 100 in 1971, and remained there in 2012. He was a Top Ten staple for thirty years, from 1979 through 2009. He’s been wildly popular throughout the English-speaking world. First, you almost certainly know a Joshua. Maybe three. Dolly Parton scored a hit with “Joshua” in 1970, and seventeen years later, U2’s The Joshua Tree was a runaway success of an album. 1983’s War Games pitted a teenaged Matthew Broderick against a top secret military supercomputer. Broderick’s character correctly guessed that the access code for the computer was Joshua – and Joshua the computer took on a (destructive) life of its own. Actors include Josh Duhamel – about to become a dad himself! – and Josh Hartnett. Music gives us Josh Groban, Joshua Bell, and a few others. Television characters include The West Wing’s Josh Lyman and Nickelodeon’s mismatched step-brothers Drake and Josh. The actor who plays the Nickelodeon character is also named Josh. The eldest of the J- named Duggars is a Josh. It’s nearly impossible to list the athletes, writers, and other notables who come to mind. Overall, Joshua has gone from Biblical obscurity to modern staple. We owe him quite a bit. He’s made ends-with-a names for boys, from Hezekiah to Luca, far more wearable. We’ve also embraced other ends with -sh names for boys – don’t you think Cash and Dash are Josh’s nephews? Overall, he’s a worthy name – as tough to pigeon-hole as James, as broadly appealing as Mason, though perhaps not quite as original or uncommon as many parents might hope. I don’t mind Joshua, but Josh has always bugged me. Of course a Joshua can go by Joe or Joss, but I’m guessing 90% are going to be called Josh… I can’t pinpoint why, but the nickname Josh feels cocky and hot-headed. I never really considered how nice a name this actually is…it was just so overused in the eighties when I was born. I probably met a new Josh probably every year of my schooling, including university. But Abby, I have to say I’m sort of delighted that you’re profiling eighties names. Whether we’d use them today or not its fun to get the backstory on names we maybe take for granted. I would be super giddy if my full name got some love this week 😉 Beyond “mean girl name rampant in the eighties” lol. If I’d been a boy, Joshua was on the list. (I was born 1994), and I’m glad I wasn’t. There were four Joshuas in my first grade class- Joshua, Josh P, Josh B, and JJ. My 18 year old brother is Joshua, and I had a big role in naming him. It was down to Joshua or my dad’s choice, Zac! it is a common name in Australia, but it suits him well. You can’t go wrong with Joshua! Although common, I feel the sound of the name itself is distinctive.